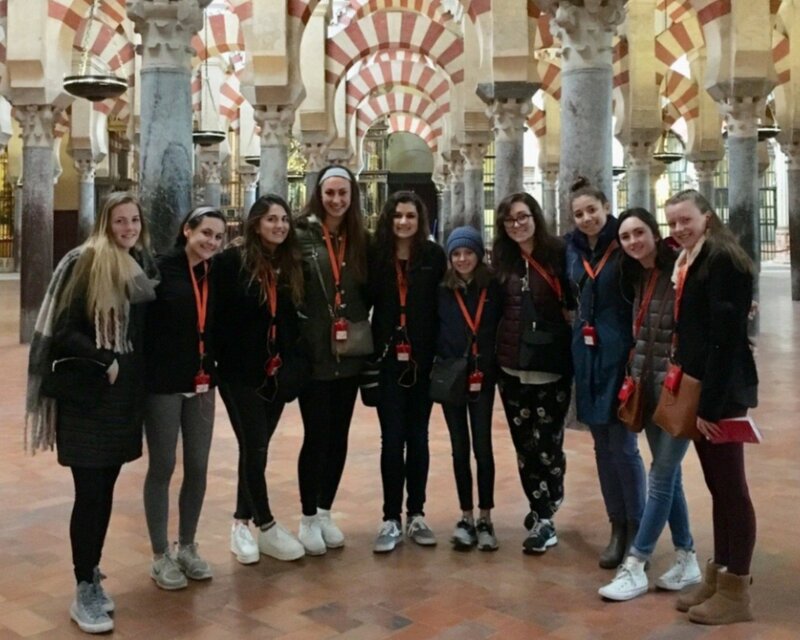 Over February Break, ten NDA students from grade nine to grade twelve visited Spain on a language immersion trip. We had the opportunity to visit Seville, Cordoba, and Madrid on our trip. So here is a brief summary of our time in Spain that will hopefully convince you to visit this beautiful country! We left Boston’s Logan International Airport at six pm (EST) on Wednesday night to fly to Lisbon, Portugal. After a smooth seven-hour flight we arrived in Lisbon at six amtheir time. We ate and then slept on the floor of the airport, to pass the time in our six-hour layover. Now I will never judge anyone sleeping on the airport floor because it was more comfortable than one would assume when you are really tired. Finally, at noon (Portugal Time) we boarded hour one- hour flight to Seville, Spain. This quick flight got everyone excited to finally finish our travel and arrive atour final destination, Spain! We met our native Spanish speaking tour guide, Ana, at the airport. We then rode a bus over to our hotel, The Don Paco, where we spent the next four nights. We had a chance to unpack and freshen up after our travel day, before heading out to explore Seville before dinner. We walked around to get a lay of the land in Seville, to see spots that we would want to return to. We had an early dinner where we tried some classic Spanish dishes all were a little delirious and ready to sleep. Today we got up feeling mostly refreshed, ate breakfast and then embarked on our first full day in Spain. Our first stop of the morning was the Plaza de España. We also saw iconic monuments along the Guadalquivirriver that runs through parts of Spain. We then toured the beautiful Cathedral in Seville, La Giralda. The views from the top gave us a bird’s eye view of the city of Seville and beyond. We learned that most churches now were mosques when the Moors ruled Spain. Therefore, many of the churches have stunning remnants of the prior religious building. After the tour,we were given a scavenger hunt to get to know Seville better. This challenged us to talk with shop keepers in Spanish about signs and places to find what we were looking for. We went back to the hotel to get our dancing shoes readybecause we were going to see and participate in a flamenco lesson. I was honestly quite nervous because my dancing skills are mediocre, but we had a great time. Now we all have a different appreciation for how challenging flamenco dancing is.